Ripped, torn, and otherwise distressed denim is once again in style this spring. This season’s incarnation of the trend, however, is a bit different from how it looked in previous decades. Instead of giving off a rebellious or grungy vibe, spring 2010 ripped denim is all about looking sultry and seductive with a little bit of edge. If you’re dying for a trendy new pair of jeans, pick up some ripped ones, and follow our tips to rock them right. Pick a style. Ripped denim isn’t just for jeans this season! You can find distressed details on a variety of denim styles this season, from shorts to mini skirts to jackets. Pick your favorite piece and go from there. Consider the occasion. Though some denim pieces (namely dark wash jeans) are usually socially acceptable for wear in dressier situations, distressed denim is very casual and relaxed, and NOT appropriate for a dressy occasion. While torn styles are great for hanging out or running errands, they’re not great going-out options. Also, if your style leans towards prim and proper, you probably won’t find ripped jeans appropriate for classroom wear. Choose how much you want to show. As a general rule, the smaller the piece, the less distressing it should have. A pair of frayed denim shorts, for example, should be less destroyed than a pair of jeans simply because the cut of the shorts is more revealing. Slashed skinny jeans have been a celebrity favorite, but avoid wearing a slashed mini skirt in an attempt to emulate their look. If you’re ever feeling overexposed, layer! Try a funky pair of tights or leggings under whatever you’re wearing for extra coverage and style. Spend wisely. You’re buying denim that’s already destroyed, so spend accordingly! 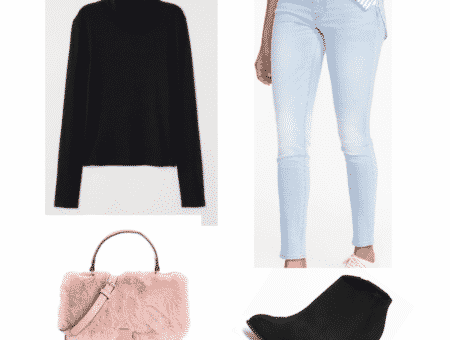 Though ripped denim is adorable and gives your style a relaxed Cali-girl vibe, this is a trend that you’re probably not going to want to drop hundreds of dollars on. Feeling creative? It’s easy (and cheap!) to distress some old jeans you already own! Check out a great DIY tutorial here. Keep an eye on placement. Notice where holes and distressed areas hit on your body. You probably already realize that a gigantic rip near your back pockets isn’t ideal, but also watch out for holes in or near the knees of your jeans. If you plan on bending down or being active, little holes in these areas can become BIG ones very quickly. Also, be careful when putting on ripped jeans! I’ve definitely accidentally stuck my toe into a hole and further ripped it on more than one occasion. Product Information: Splendid Oversized Jersey Tee, ShopBop. Unlock My Heart Necklace, Forever 21. Painted Denim Shorts, American Eagle. Pastel Studded Hoop Earrings, Fantasy Jewelry Box. Laredo Leather Western Boot, Delias. BKE Ribbed Tank, The Buckle. Product Information: Central Park West Tristan Ruffle Top, Piperlime. Ciao Bella Cutout Leather Flats, Bluefly. Always Skinny Destructed Jeans, Gap. Cameo Sequin Headband, Miss Selfridge. I Love You Pendant Necklace, Monsoon. Product Information: Full Tilt Boyfriend Tee, Tilly’s. BKE Jewled Cuff Bracelet, The Buckle. Teardrop Cocktail Ring, Zappos. Siwy Hannah Slim Jeans, Shopbop. Lucky Brand Havana Mosaic Scarf, Piperlime. Multi Stud Gladiator Sandals, Wet Seal. Are you excited to see ripped denim emerge again this season? Do you already own any ripped, destroyed, or distressed denim pieces? If you do, what are your tips for wearing them? Let everyone know with your comment!